Looking for easy access to all areas of Sydney? The Sydney Hills is a smart choice for a ‘centre of Sydney’ location – right where your clients need you to be. 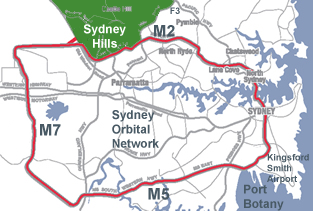 Positioned in the North West Growth Corridor, the Sydney Hills is just a short drive for clients in North Sydney and the CBD as well as Western Sydney and the South West via the M2 and M7 motorways, with linkups to regional and interstate markets via the M5 and F3 motorways. The cities of Parramatta, Chatswood, Blacktown and Penrith are just moments away. Sydney Airport and international cargo shipping at Port Botany are both just 40 minutes away. Position your business in the Sydney Hills and you strategically position yourself to create easier access for existing clients while opening up to unexplored markets. The Hills Shire boasts reliable, world class electricity, natural gas and water supply networks. Prices for business and industrial users of electricity and gas are among the lowest in the country. In addition, NSW utilities provide the highest levels of service reliability nationwide. Integral Energy, the local utility distributor, is in the midst of upgrading its subtransmision network (132kV) to meet the Hills Shire's ever growing residential and business needs.